Don't Miss Out: Drum Night is Nov. 7th!! A drum circle is a rhythm-based tool for unity. This event will be led by the founder of Drumtime, John Lacques who has facilitated hundreds of drum circles since his start in 2003 (check out the videos below to see what a drum circle is all about). If you've never touched a drum before or you are a seasoned professional, you will find a sense of belonging and community in a drum circle. It is fun, uplifting and dynamic. This great event will support Art Trek and One Spark Academy. Click the banner below to sign-up for the wonderful community event! *All ages and abilities are welcome to join us. This clip shows John Lacques of Drumtime facilitating some rhythm-based events from 2005-2008. Drumtime offers drum programs for team-building and professional development, school programs, special needs' and at-risk communities, private events and more. 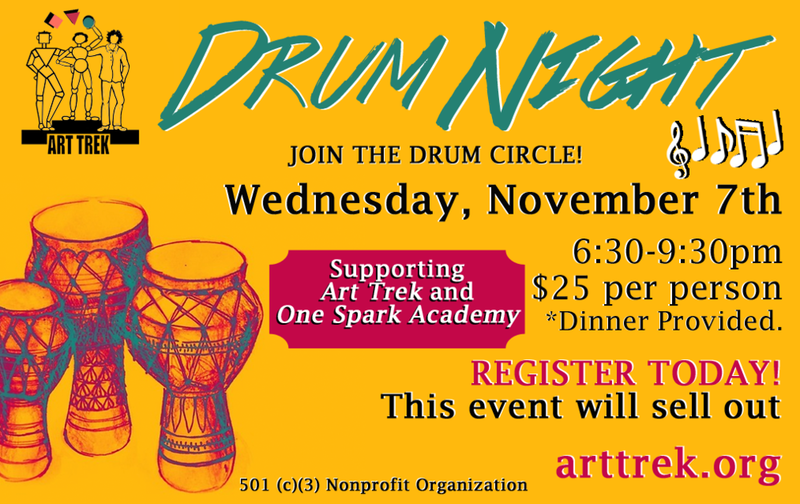 Posted on October 24, 2018 by Cordelia Miller and tagged Art Trek One Spark Academy Drum Night drumming Drumtime John Lacques drum circle dinner provided all ages.